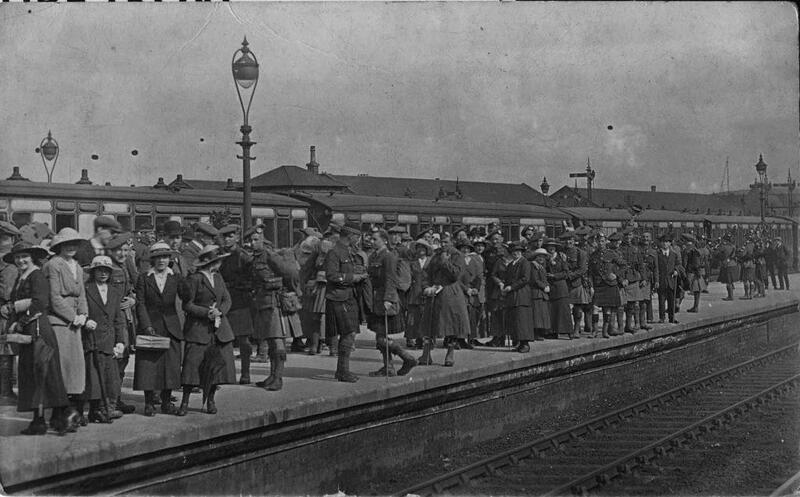 The photograph shows a scene in Stirling Station all too common a hundred years ago as battalion after battalion left Stirling, either for further training or for service in the Great War. Families gathered on the platform to say farewell, possibly for the last time. Stirling Station has never been busier. The Stirling 100 exhibition, featuring 100 Stirling soldiers who died in the War continues at the Smith until November, and is accompanied by all of the Great War photographs in the Smith collections. Today’s photograph is from a family collection loaned by John Robertson ten years ago. To provide an opportunity to understand different aspects of the War to end Wars, Stirling University teachers are holding a series of free talks at the Smith. The next, at 2pm on Thursday 1 October is by Dr Michael Penman will discuss how Bannockburn was commemorated in the century 1814 – 1914. At 11am on Friday 23 October Professor Rory Watson will talk about Poetry and the Great War. The talk by Dr Jim Smyth at 2pm on Friday 6 November 2015 on ‘Music, Memory, Emotion: Unveiling the memorials of the fallen of the Great War in Scotland’ takes us in to the Remembrance season.